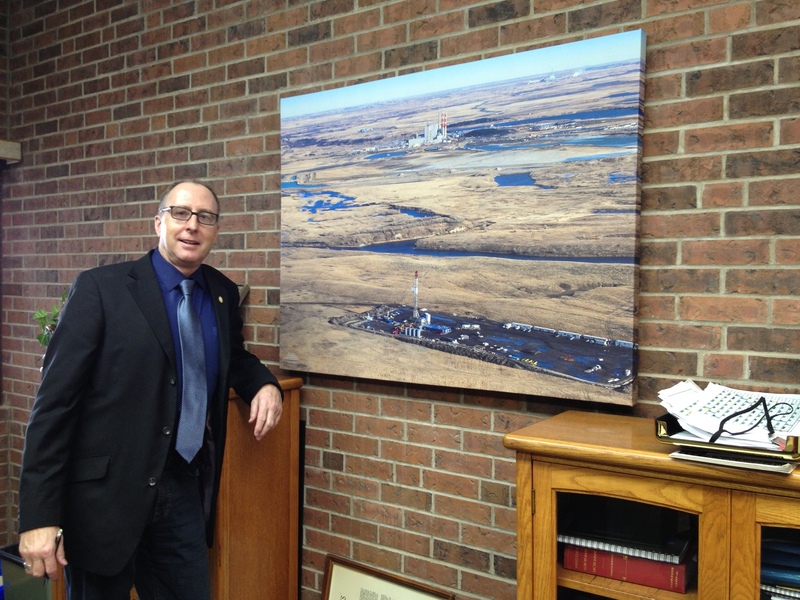 Estevan Mayor Roy Ludwig beside his new canvas print for his office. As a miner for 36 years, I am guessing he has been on every inch of territory seen in this photo. It’s been a pretty exciting week, with several fine art canvases being delivered this week. First up was one picture that is now hanging in Estevan Mayor Roy Ludwig’s office in Estevan City Hall. It’s an aerial shot that was taken last fall while I was doing another shoot for Panther Drilling. The pilot was kind enough to take me over the Aquistore drilling site near Boundary Dam Power Station. When I zoomed in on this shot, I was surprised at all that was in it. It basically has everything important to the Estevan economy in one shot. The Aquistore observation well was drilled next door. That’s the well the rig is on in this picture. The only thing it’s missing is a pumpjack. I’m sure there are some in the far background, but they are not visible. This was one of the largest prints I have ever made. It’s 36×48, or 12 square feet. It’s about as big as the door I hung it from to dry after printing. What’s even more remarkable is you need to blow up this picture that large to see all the details I just listed. That’s what amazed me – how much detail can be found in these photos now. The second sale is to Western Star Inn & Suites. I provided several prints, including canvas and metallic paper on gatorboard, for their Carlyle location last year. This is for their new Stoughton location, which just opened. The four prints are, from left to right, CanElson at Stoughton, Vortex 1 at Lake Alma, Panther 4 at Benson, and Betts 1 at Northgate. The CanElson rig (I’m not sure which one) was photographed just half a mile from the hotel location, southwest of the intersection of Highways 13 and 47. You can see the resulting pumpjack from the breakfast area window. The large blue print, Vortex 1, is the same size as the mayor’s print – 36×48. The remaining prints are 24×36. 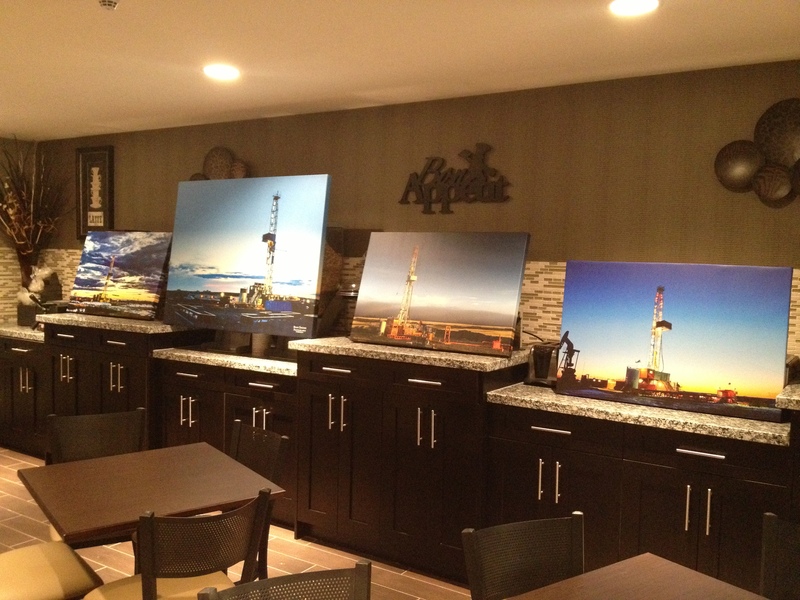 Finally, one of my 24×60 Kisbey fenceposts and three rigs prints was delivered on the same day to a service rig hand who is working near Estevan but staying at the Carlyle Western Star. It’s a copy of the print hanging in that hotel’s lobby. Out of the roughly 400,000 photos I have taken since 2003, that photo has received more interest than any other. It’s my signature piece these days. My prints were available at Estevan’s Pharmasave until this past Christmas. Watch for more to be available at Ron’s the Workwear Store in Estevan and Weyburn in March. There’s one of the Kisbey fenceposts and three rigs in Weyburn right now. Otherwise, you can contact me directly.